A laser chiller is used in managing laser temperature to ensure the efficient operation of different laser systems like medical lasers, industrial lasers, and other laser systems. 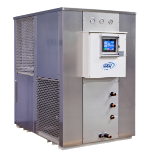 Laser chillers are self-contained devices that remove heat from heat emitting components of any system. There are two kinds of laser systems that require specific chillers, high-power and low-power. The performance of the high-powered lasers depends on effective cooling, and choosing a chiller would require a comprehensive knowledge of the cooling requirements. The low-powered lasers that need temperature control can use air cooling or a steady flow of ambient-cooled water to a cold plate to cool the laser, and doesn’t necessarily require a chiller. Some laser manufacturers however, supply chillers with their lasers while others may suggest other chillers or chiller companies that produce chillers that are very compatible with the lasers they supply. When looking for a laser chiller, identifying the size of the chiller is the first and most important step as a chiller that is not correctly sized may cause a lot of problems down the road. The next step is determining the cooling requirements of the laser system in order to select what company or specific chiller to purchase. Another thing to consider is the type of coolant needed by the laser. Most chillers can use regular distilled water while others require more advanced coolants like glycol. Again, this depends on the power level of the laser. The last thing to look out for is the pump for the chiller with regards to the flow rate. Fully understanding your laser system and its requirements will provide you and your chiller manufacturer with the necessary information to purchase the right chiller for your applications. Laser Chillers Laser chillers are used to remove the heat generated from the heating of different components in a system. The whole idea behind laser cooling is to maintain a precise laser wavelength and higher output efficiency to achieve a desired beam quality and reduce thermal stress on a laser system.